Many fine furniture projects such as tables, chairs, etc., call for tapered legs. While there are many methods that could be used to create such tapered legs, probably the easiest is with a tapering jig for your table saw. A tapering jig allows you to adjust your tapered cuts to nearly any angle up to about 15 degrees and consistently rip such angles. The good part is that a tapering jig is a very simple tool to build, one that you'll find useful for numerous projects. Cut Two Boards to Length. (c) 2009 Chris Baylor licensed to About.com, Inc. The first step of these free woodworking plans for a tapering jig is to cut two boards of equal length from your piece of stock. I find that 30-inches is about the right length for the two sides of the tapering jig, but if you want a longer or shorter tapering jig, you can adjust your lengths accordingly. Just make sure that both boards are the same length. Attach the Hinge to the Boards. (c) 2009 Chris Baylor licensed to About.com, Inc.
With both side boards cut to equal lengths, the next step to building a tapering jig is to attach the hinge to one end of the two boards. I find that a 2" x 3/4" hinge works great for boards of this size. 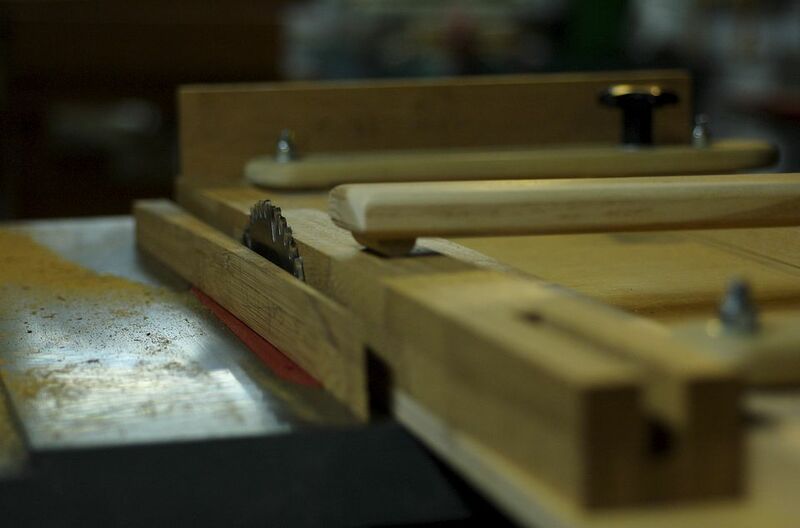 Just make sure that the hinge pin is parallel to the ends of the two boards so that the tapering jig will open and close smoothly. Drill Holes in the Two Side Boards. (c) 2009 Chris Baylor licensed to About.com, Inc.
After drilling the hole cleanly through the edges of each board, drill a countersink for each hole on the bottoms of each sideboard. Be sure that the countersinks are deep enough that the heads of the carriage bolts will not protrude from the bottom of the jig. Insert the Bolts. (c) 2009 Chris Baylor licensed to About.com, Inc.
With the holes and countersinks drilled in each side of the tapering jig, insert the carriage bolts through the holes and tap them into place, verifying that the heads of the carriage bolts are safely beneath the surface of the bottom of the two sides of the jig. Drilling Holes in Spreader Bracket. (c) 2009 Chris Baylor licensed to About.com, Inc. The tapering jig is held at the appropriate angle with a spreader bracket, which you probably noticed in the picture on the first page of these free woodworking plans. To begin building this spreader bracket, cut a piece of 1x3 or 1x4 to 2" wide x 8" in length. Round over the edges with your jigsaw as shown in the image above. Next, draw a pencil line down the long axis of the board at the center line, which should be one inch from each side. Then, using your cordless drill or power drill, make three 1/4" diameter holes, one at 1/2" in from each edge (on the center line) and the third at 1" in from one edge, also on the center line. Cutting the Slot in the Spreader Bracket. (c) 2009 Chris Baylor licensed to About.com, Inc. In the next step of these tapering jig plans, you'll need to cut a slot in the spreader bracket. Using a pencil and straight edge, draw a line from the top edge of the center hole in the bracket to the top edge of the hole farthest away (on the opposite edge of the bracket). Then draw a parallel line between the bottom edges of these two holes. Attach the Lip to the Tapering Jig. (c) 2009 Chris Baylor licensed to About.com, Inc.
Before completing the tapering jig, there is one additional piece of stock that needs to be added to the left half of the jig. This piece of stock will actually push the board being tapered through the saw blade on your table saw. Cut a 2" wide piece of stock from your 1x3 or 1x4, and attach this piece to the left side of the jig, up one inch from the end of the board with a couple of deck screws using your cordless drill or power drill. This board can be positioned flat against the left edge or butted against (as shown in the image above). Attach the Spreader Bracket. (c) 2009 Chris Baylor licensed to About.com, Inc. Position the slot of the spreader bracket over the left carriage bolt and the hole over the right carriage bolt. Tap the bracket down into place. Then, add a flat washer and lock bolt onto the right carriage bolt and tighten until the bracket is snug, but not so tight that it won't rotate on the bolt. You should now be able to move the left bolt through the slot, widening and narrowing the tapering jig. If satisfied with the freedom of movement of the jig, attach a flat washer, followed by a lock washer and then a wing nut onto the left carriage bolt. Using the Tapering Jig. (c) 2009 Chris Baylor licensed to About.com, Inc.
To use your tapering jig, adjust the angle of the jig and tighten the wing nut. Then, position the board to be tapered firmly against the left side of the jig, with the end of the board against the lip at the bottom end of the jig (as shown in the image above). Next, place the right-hand side of the jig against your table saw fence, then adjust the position of your fence so that you're cutting the taper at the desired width. Hold the board against the jig and the jig against the fence and slide the entire apparatus through your saw blade. You should end up with a consistent, cleanly tapered board!